While She Sleeps is a British metalcore band from Sheffield, England. Formed in 2006, the group consists of vocalist Lawrence Taylor, guitarists Sean Long and Mat Welsh, bassist Aaran Mackenzie and drummer Adam Savage. They are currently signed to Search and Destroy Records in the UK, Good Fight Music in the US and Shock Records in Australia. Since releasing their debut mini-album The North Stands for Nothing in 2010 they have gathered quite a large following despite not releasing a full-length album to date. 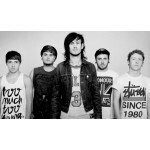 Set to release their debut studio album This Is the Six on 6 August 2012, While She Sleeps have received a lot of praise from the UK press and won the award for Best British Newcomer at the Kerrang! Awards 2012.